On the way to Chelan for a conference with my coworkers, I had the opportunity to stop by Glacier Peak Winery in Rockport, Washington. I hadn’t heard of Glacier Peak before, but it was right along Highway 20, and it was open, so we stopped in. To be honest, we probably wouldn’t have stopped if the other two wineries that we tried to go to before Glacier Peak had been open, but since they weren’t, it was their lucky day! Four ladies let loose on a Tuesday afternoon! For $5 (refundable with purchase), you could sample the wines. 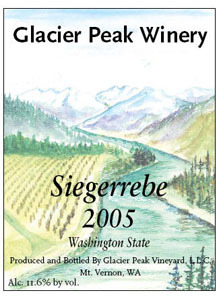 I started with the Siegerrebe, and also tried their Pinot Noir, Syrah, Merlot and Cabernet Sauvignon. The last three were not to my taste, but the Siegerrebe and the Pinot were pretty good. After we got home, Jon opened the bottle of 2008 Pinot Noir that I purchased there, and was skeptical that it would be any good. Pinot is a difficult varietal to grow, because it is quite particular about the climate – it likes a climate that is cooler than other types of grapes. Glacier Peak grows their Pinot Noir on site. The nose on this Pinot has aromas of blackberry and earth. It is a bit darker in color than other Pinots I have tried, more reminiscent of a California Pinot than an Oregon Pinot. The mouthfeel is soft and light, with a nice silky texture. The blackberry scent on the nose is apparent in the taste of the wine as well, with soft flavors of smoke and pie cherry coming through.